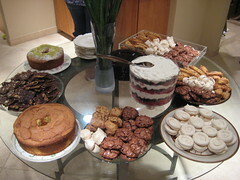 That is some beautiful grouping of Passover desserts. How long did that take you? Mine are mostly chocolate for our chocolate fans and nutty cookies and cake for my husband. They are all good. I am sure yours are also. Happy Holiday. Hi Chaya. I got into town on Saturday and started that night. We had to make enough for 25 people the first night and 45 people the second night, so we were busy! 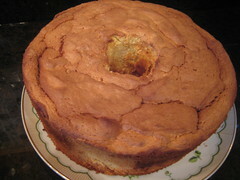 I may not be a fan of angel food cake but I really adore chiffon cakes! And absolutely love the look of the dessert spread! Lucky folks!